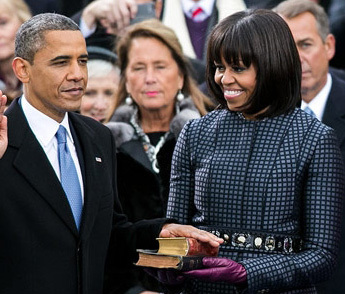 As has been widely reported, on Monday President Obama swore on a stack of bibles to uphold the Constitution. On one hand, maybe doubling-up on the sacred iconography will reassure those on the right who doubt the President’s sincerity, but the primary purpose was to honor two periods of American history simultaneously. This year marks the 150th anniversary of the Emancipation Proclamation and the 50th anniversary of the March on Washington, and the bibles were direct material links to those eras: one was the bible on which Abraham Lincoln took the oath of office in 1861, and the other belonged to Dr. Martin Luther King, Jr.